The Cuisinart FCT22-24 French Classic Tri-Ply Stainless 10-inch Fry Pan is manufactured and assembled in France. This is a beautifully crafted pan that heats nicely. Also available in this product line are 8-inch and 12-inch pans and French skillets. These fry pans are induction ready and can also be used with gas, electric, glass ceramic and halogen stoves. The base and sidewalls of the Cuisinart FCT22-24 French Classic Tri-Ply Stainless 10-Inch Fry Pan have two layers of stainless steel with a core of aluminum between them. Cuisinart employs Heat Surround™ Technology which allows for the even distribution of heat along the bottom and sides of the cookware. It can be used on the cooktop and in the oven and broiler up to 500ºF. The interior is polished stainless steel while the outside is a brushed finish and the rim has a mirror finish. The diameter of the base is 6 ½ inches and the pan is about 2 inches deep. It weighs 2.4 pounds and is not heavy nor is it cumbersome to hold. The handle is 7 ¾ inches long and very sturdy. It has a thumb rest which is shaped in such a way that it is easy to grip and balance, so the pan doesn’t pull to one side. When frying an egg (on an electric stove – heat setting 4), I noticed the thumb rest got a little bit warm. However, I could still rest my thumb on the pan. There was no heat from the end of the thumb rest to the end of the handle. The rivets are stainless steel with aluminum caps. The edges of the rim are smooth for safe cleaning. I liked the fact that I could fry an egg in this pan without it sticking. The following is the process I used. Gather necessary utensils and ingredients as the pan can overheat quickly. Crack egg into a small bowl, saucer or small plate. Preheat pan using water drop test. I put in about 1/8 tsp at a time. When the water stays in a big ball and rolls around the pan along with just a few smaller beads of water, the pan is ready for the addition of the butter/oil. The video below shows how to preheat the pan properly. Use low to medium heat for a smaller pan. NOTE: I used a setting of 4 on an electric stove. Take the pan off the burner (don't wait for the bubble to evaporate), wipe off any water that is still in the pan and add enough butter to lightly coat entire surface of the pan. Tilt the pan to spread the butter. Once the butter has melted, let the foam subside a little, place the pan on the burner, and then slide the egg into the pan. Cook until the white part is set, and the yolk thickens. Then run the spatula (I used a stainless steel slotted spatula while some prefer a silicone spatula) around the edge of the egg. 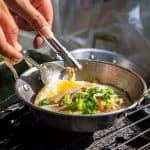 Toss the egg and cook to your satisfaction. Cuisinart states in its Use and Care guide that the pan is dishwasher safe. However, they give various scenarios as to how the pan can be damaged in a dishwasher. 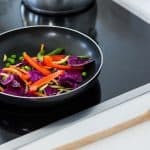 There are varying opinions as to how to clean stainless steel cookware. One recommendation is to wipe the pan clean with a paper towel, rinse in filtered water and if necessary, scrub with a nylon mesh cloth and dry with a microfiber cloth. Another suggestion is to put a non-lemon (to preserve the finish) detergent on a damp (filtered water) microfiber/nylon mesh cloth and wipe the cookware surface in the direction of the grain. Then rinse off and thoroughly dry with a microfiber cloth. NOTE: While practicing frying eggs, I had one egg that stuck to the pan in a spot that was about the size of a dime. I made a paste of baking soda and water and rubbed it on the spot. The pan was cleaned and dried in a very short time. Baking soda, vinegar, Bar Keeper’s Friend and Cameo® have been recommended to remove stains or burnt food. Cuisinart included a written warranty with the Cuisinart FCT22-24 French Classic Tri-Ply Stainless 10-Inch Fry Pan. It states it is a lifetime warranty. 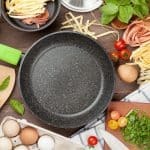 However, there are many exclusions including but not limited to: incidental or consequential damage, misuse or abuse (this includes damage due to overheating), and scratches, stains, discoloration to external or internal surfaces unless they impair the “functional utility” of the cookware. Additionally, the customer is required to pay the cost of shipping the item to Cuisinart along with a check or money order (see warranty for the amount) to cover the cost of return shipping (requirements are different for California residents). To prevent hassles with the Warranty Department, it is wise to register the product upon receipt. As with all cookware purchases, inspect the item(s) thoroughly as soon as the product is received to make sure there are no scratches, discolorations, dents and that the bottom is flat.